Oven roasted potatoes give this potato salad unique flavor and texture. The potatoes are dressed with a simple, savory mixture of mayonnaise, sour cream, and lemon juice. Dill, red onion, chives, and garlic provide color and flavor. It's easy to make, especially if you don't peel the potatoes. There is no need to do so as the skins will add nutrition and extra flavor to the potato salad. This potato salad will be the hit of the cookout or potluck, and it goes well with grilled meat, chicken, or burgers. 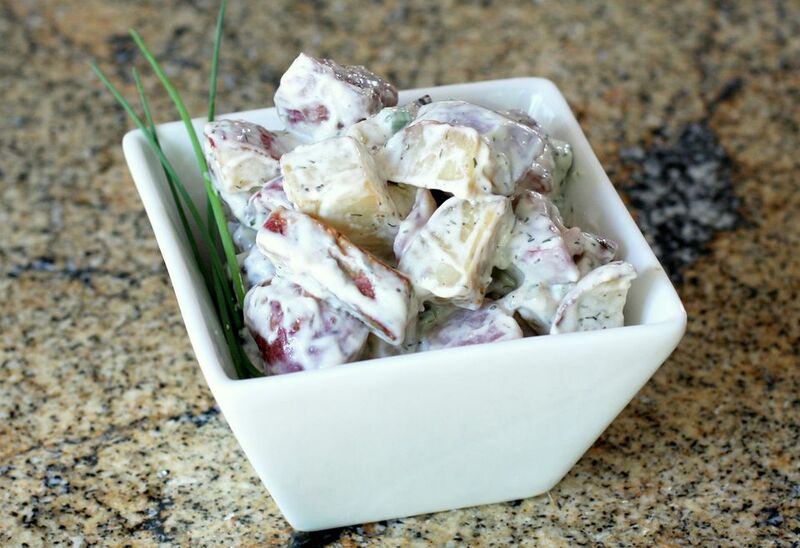 Add a little diced cooked bacon to this potato salad for extra flavor. Line a 9-by-13-by-2-inch baking pan with foil; brush the foil lightly with a small amount of olive oil. Scrub the potatoes. Peel, if desired, and then cut them into bite-sized pieces, about 1/2 inches to 3/4 inches big. Peel the red onion and cut it into 1/2-inch pieces. In a large bowl or in a food storage bag, toss the potatoes and onion chunks with the olive oil, garlic, dill weed, chives, salt, and pepper. Transfer the potato mixture to the baking pan and bake for 45 to 55 minutes, or until potatoes are tender. Stir occasionally so the potatoes will brown evenly. Let the potatoes cool completely. Combine the mayonnaise, sour cream, and lemon juice in a small bowl. Toss the mayonnaise mixture with the potato mixture, adding more mayonnaise if needed. Serve the potato salad cold. Refrigerate any leftovers in a covered container. This potato salad doesn't contain eggs, and if you are using commercially prepared mayonnaise it should be relatively safe to take to a picnic. However, it is always wise to keep your potato salad refrigerated until it is used. This recipe also works well when using baby potatoes. Cut them into halves or quarters, depending on their size, before roasting. You can explore a variety of ways to change up this recipe. Besides adding bacon, consider adding some spicy mustard or horseradish to give it a little bite. Basil, thyme, and rosemary can give it a sophisticated flavor and pair it well with French or Italian dishes. Adding some chopped cilantro instead of the dill will give it a Southwestern flair. You can roast other vegetables along with the potatoes, such as red or green bell peppers, chopped asparagus, or cauliflower.